I’m taking a short break now from hand sewing. I have cohesive bandage to lay down as I think I’ll need it. Anyway. 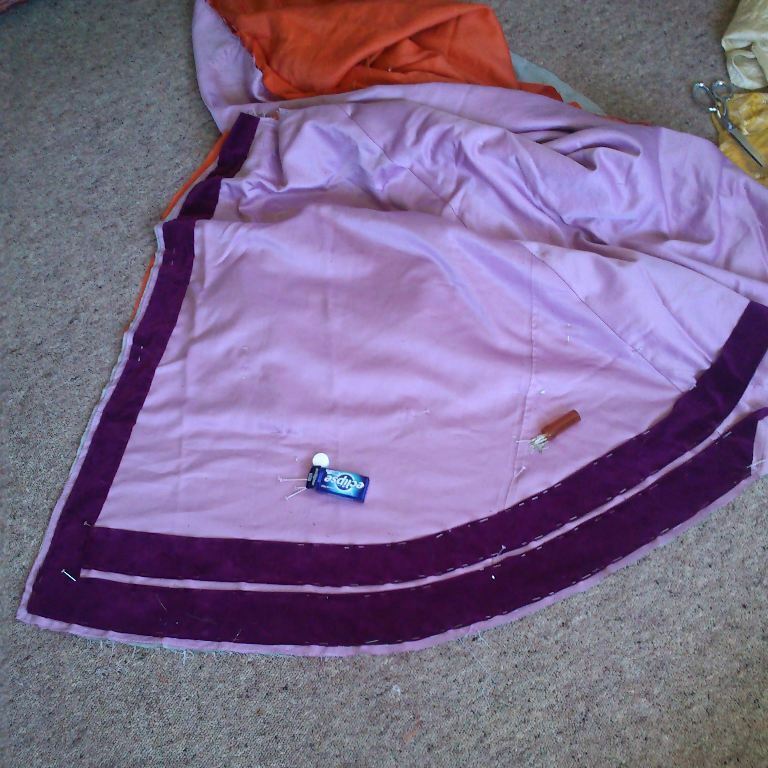 I forgot how annoying and fiddly it is to hand sew a piled fabric to a fabric that is springy but without a pile. Thread just stretches and the turn under moves. Like moves moves. I am not sure I can adequately measure so I have to eye it. I also think I’m doing it wrong. It’s absolutely right going by portraits but every single extant example has a narrow braid/twists of thread to hide what is likely a raw edge. Because yes, velbet has always been a PITA to work with. My best work involved making card templates and pressing and steaming my velveteen over it and still unpicking every single hem at least once. I cut my guards to shape. 8cm wide from one selvage for the fronts and then I laid the fabric over my right sikirt front and pinned at regualr intervals 8cm for each guard. SO far so simple. But the velveteen has a nap. Which means turning and turning the remaining fabric to make sure the pile goes up- so the velveteen looks the most rich. Then I lined up left over to the back centre which means piecing at the sides. This is based mainly on what Alcega has to say- actually all the Spanish tailors. All piecing is at the sides. Like everything. Or under arm, but basically sides are a mess, underarms next, CF and CB pretty much untouched. The Austrian tailors also show piecing in places we may not automatically think of. I suspect it has everything to do with expectations. 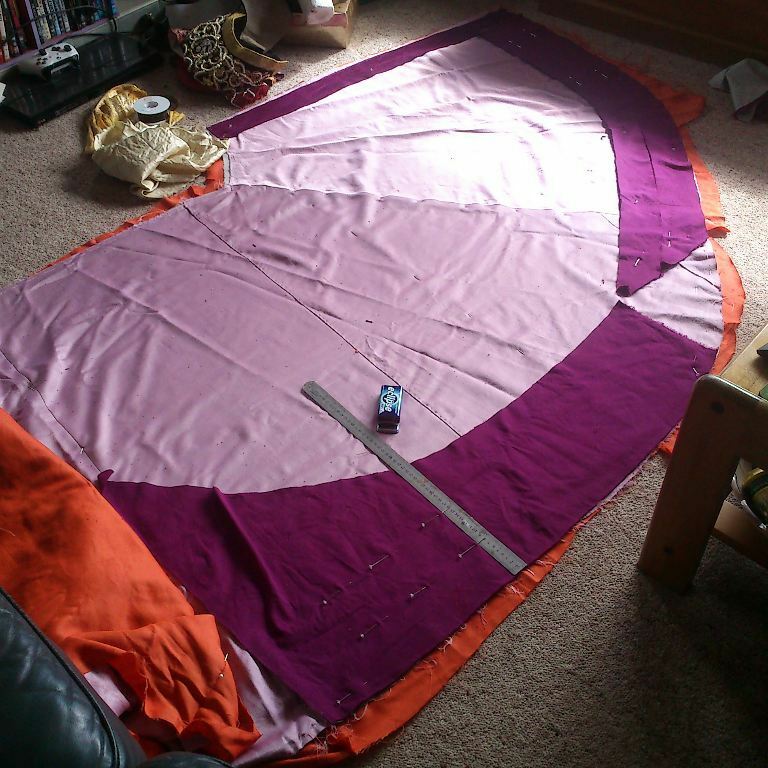 We expect no piecing- we limit most pattern pieces by the width of fabric. this is mostly okay when you can top and tail perfectly shaped pieces. But historically really special fabrics were narrow. So it was expected that they would not be wide enough so vertical seams at regualr intervals were expected. And ad they tend to be near the side seam it is a handy place to add any piecing as ther eis already an expectation of seams there. So Centre Front and Centre back being, usually, cut with the selvages are expected to be continuous. There are obviously exceptions. But this is the rule. Anyway, so after matching fabric I was even able to follow the curve to cut my neckline guarding. And then was able to make strips for arm guarding. I only hand sew while sitting cross legged. SO I do have to stop every so often to stretch. But knees make for a very handy “frame” to stitch. 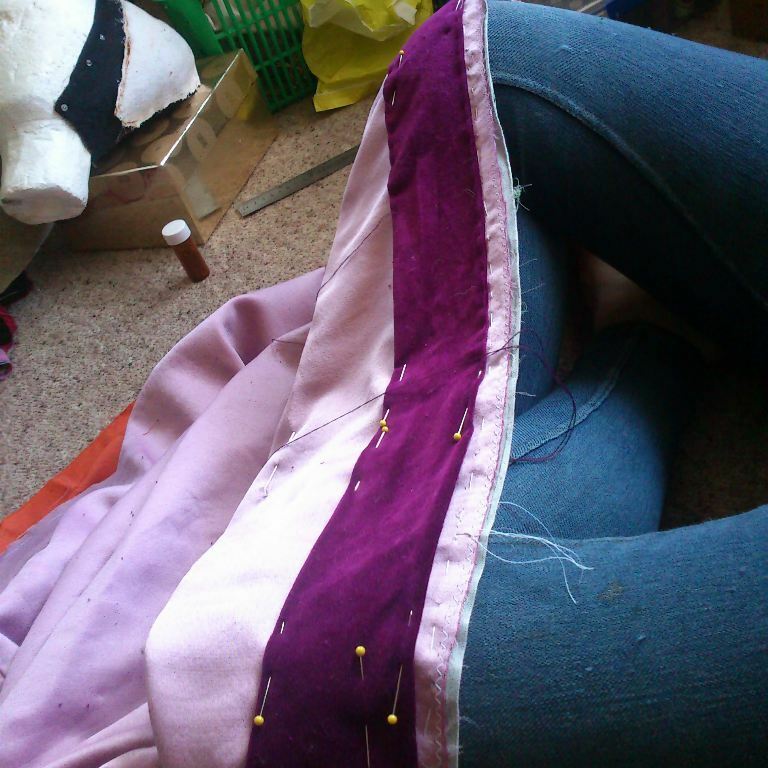 Also you can adjust tension by just moving, and also it only take a pin at each seam being worked on. So there is heaps to go and I have to pace myself or risk not being able to go to the event at all. I can work on hems while there as I have my linen kirtle and silk frock. So you know. I am set to just pack. But I want this dress and hat. And then I can upload my resources. So i think I should do some stretches and call it an evening.